Fall 2010: After the trip down to Illinois, I posted some photos of Toby and I’s cars in his driveway at his Nissan BBQ on Zilvia. I received a message from someone on a local forum saying that his brother was the editor in chief of Modified Magazine and that he wanted to do a feature on Toby and I’s cars for the magazine. I nearly fell out of my office chair when I read the message. I grew up reading Modified and had emailed with Peter a couple times over the years when my Solara was in the “Reader’s Rides” issue. I contacted Peter and he asked if I could get him in touch with Toby. Once we were all on the same email chain, Peter explained that he really liked the home built street car vibe that our cars put out and that he wanted to do a feature in Modified about the cars together as the cars contrasted well (white vs. black and coupe vs. hatch.) Peter actually thought that we both lived in the same town, so when he found that we lived about six hours apart he asked if we could meet in Chicago for a shoot before winter hit. Toby and his wife were expecting his second daughter right around that time, so he wasn’t able to leave his home town for the time being. I happily agreed to drive back down to Normal, Illinois again just a couple weeks after being there for the BBQ to have a photographer from Modified shoot our cars. My wife Alicia and I drove down to Illinois on a Saturday morning and spent the afternoon and evening with Toby, Kyle, and Nate Hassler from Modified. We drove all around town shooting photos of the cars and did more of the same on Sunday before heading home. This was an awesome experience for me as Modified was one of my favorite magazines growing up and I had always been interested in working in the industry. Nate was a really cool guy and helped make the experience a good one. After the Modified shoot, the long wait to see the magazine began. The weather had began to take a turn as it does every year in Michigan, so I was more or less done driving the car for the season at this point. I did manage to take the car to the drag strip before putting it away and was able to run a 12.9 @ 114 MPH which I was pretty proud of considering the car was not remotely set up well for drag racing. Aside from that little outing, it was basically time to put the car away for winter. 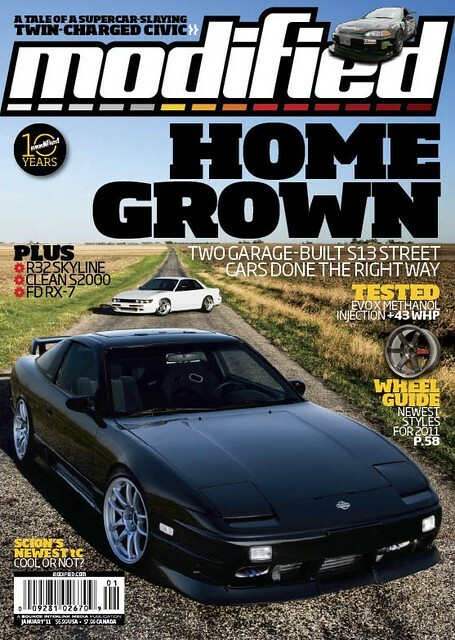 The next couple months passed by while I waited anxiously for the issue of Modified featuring my car to come out. I had always dreamed of having my car featured in a magazine since I was in ninth grade, so I was beyond excited to see the issue. As fate would have it, Toby and I ended up being featured on the cover of the magazine and they chose to use a photo with my car in the front. Pretty crazy! We were on vacation in Florida when I got the word that the issue was on news stands and we were able to find it at a book store down there. It was such a cool feeling to walk into the magazine section and see my car sitting on the shelf. Truly an honor. For the first time since I had owned my S13 I didn’t have any big plans for it during the winter months. It was nice to take a break and not have to spend numerous nights on the cold garage floor trying to get the car put back together. However, I did decide to make a couple small changes to the car during this time. Just after Christmas I ordered a set of mercury silver Volk TE37s through Mackin Industries. I essentially kept the same specs as the Work CR Kais I had, but I had always wanted to own a set of TEs. I debated going with bronze as they were in stock stateside at the time, but I decided to stick it out and wait for my silver TEs to be made. 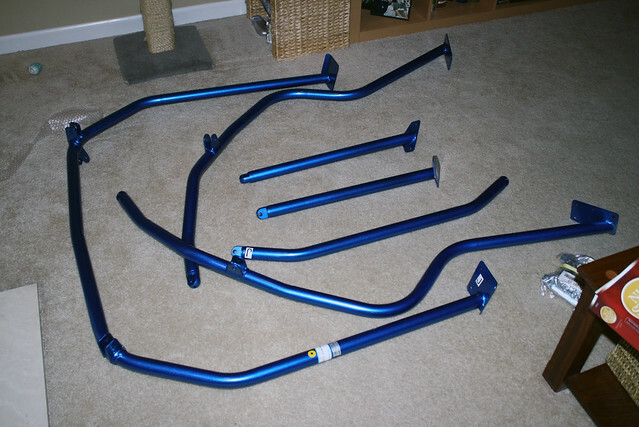 In addition to ordering some new wheels for the 2011 season, I also ordered a Cusco six point dash escape roll cage. I had seen a number of 180s with this cage online and spending some time with Toby’s coupe down in Illinois finally sent me over the edge. My final overseas order for the offseason in 2011 was a new Bride Zeta III. I had never known for certain if my Zeta III was genuine or not since I had bought it used, so that always bothered me. I sold it and ordered one new from Japan just to be sure. It ended up taking quite a while for me to receive my parts due to the earthquake and tsunami that struck Japan in March of 2011. I believe my cage and seat took about 10 weeks and my TEs did not arrive until May- a total wait time of five months. As the weather broke and spring began to slowly arrive, I made a few other changes to the car. I replaced my K-Sport coilovers with a set of DMAX coils and finally decided to refresh my front suspension. I installed SPC tension rods, Energy suspension lower control arm and sway bar bushings, new ball joints, and a NISMO power brace to bring the front suspension up to speed with the rear setup I had previously refreshed. I also had my front bumper and fenders repainted to repair some previously less than quality paint work. 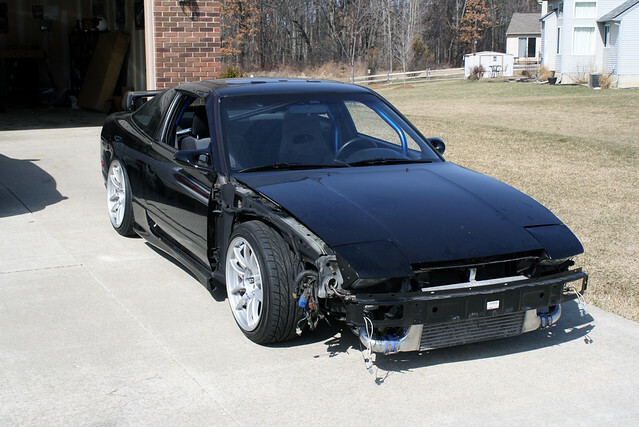 It was during the spring of 2011 that I temporarily owned a second S13. My friend Tim purchased my Work CR Kai wheels and offered me a fairly clean white S13 shell as partial payment for the wheels. I thought it over and decided to accept it with the hope that I could throw a KA in it and learn to drift with the chassis. The idea was going to be to keep the cost as low as possible. After hauling the chassis to my grandfather’s house, it became apparent that I wouldn’t be able to build the car in an inexpensive manner. 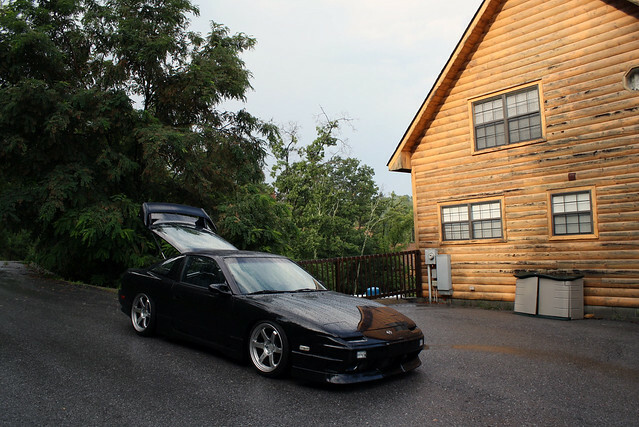 I ultimately decided to sell the car before beginning down the path of building a second S13. From a space and economic standpoint it just didn’t make sense. I wish I could have kept it to this day, but it just wasn’t in the cards for me. My TE37s finally arrived in early May of 2011. This was probably my favorite look for the car during my ownership. I really liked how the silver popped against the black and the TEs really gave the car a timeless look. I dropped down to a 215/40 tire up front and lowered the car a bit more which also really made a big difference from an appearance standpoint. By this point the cage and new seat were installed as well, along with a set of Defi Advance CR Gauges. Not taking the car apart to an extreme level over the winter meant that it was ready to drive and enjoy earlier in the season than it had been the previous year. I put about 17,000 miles on the car during 2011 and took it to a number of events including local car shows and meets as well as Import Alliance in Tennessee. Alicia and I took an extended trip after that event to stay in a cabin in the mountains for our second wedding anniversary. We drove the car through all kinds of terrain and suffered through the 13 hour drive home in 94+ degree temps, but somehow the car seemed to hold up well! Shortly after arriving home from our Tennessee trip, I blew 5th gear driving home from the office. I think this happened on a Monday and I was planning to take the car to Chicago on Friday of that week for the WekFest show. Fortunately I was able to find a replacement transmission and install it in the car just in time to make it to the show. Wekfest was another highlight for me as I got to meet Josh and Chob from what was at the time JUNKHOUSE as well as Philstar from Grip Gambler. I thought it was really cool that they were so kind to me and complimentary of my car considering the fact that I wasn’t a drifter. 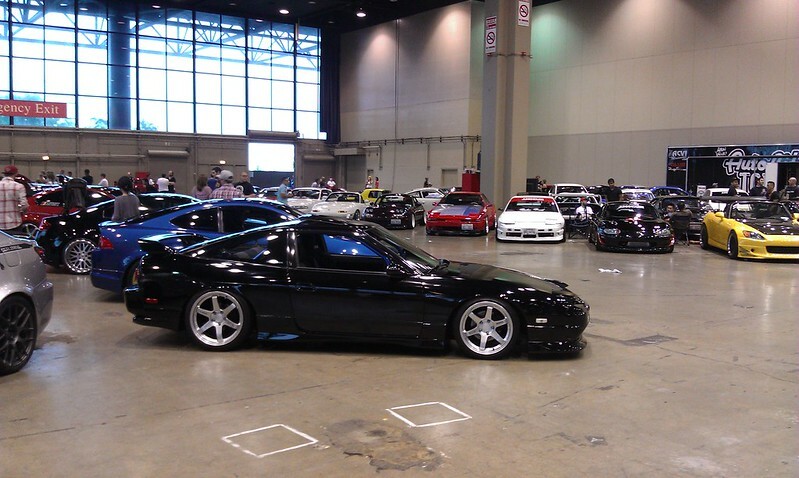 It was cool to see a lot of cars from Chicago that I had previously only seen on the internet and to be a part of the event. After Wekfest, I believe the last major event of the season was Toby’s Nissan BBQ. 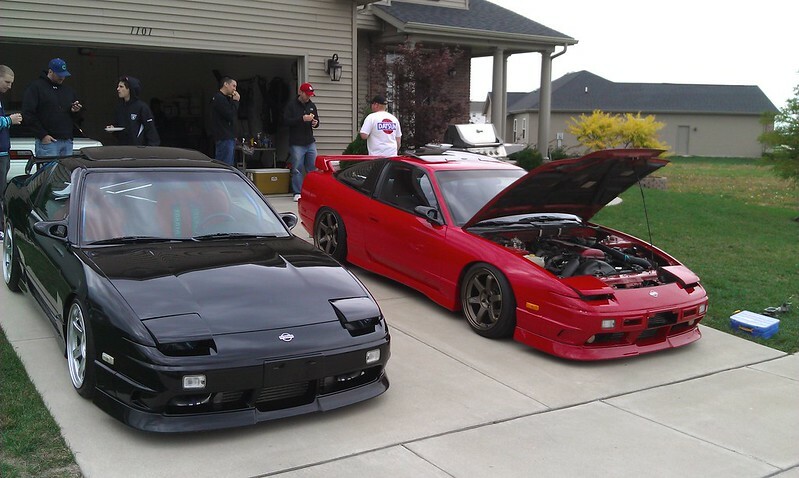 Kyle had purchased a really cool red kouki 180SX on bronze TE37s over the winter (I think) and we had hung out a few times during the summer, so we were excited to have the cars together one more time. Just before the event, I traded my Zeta III to a fellow from California in exchange for a red pair of Bride seats: a ZEROS and an Ergo 1.5. 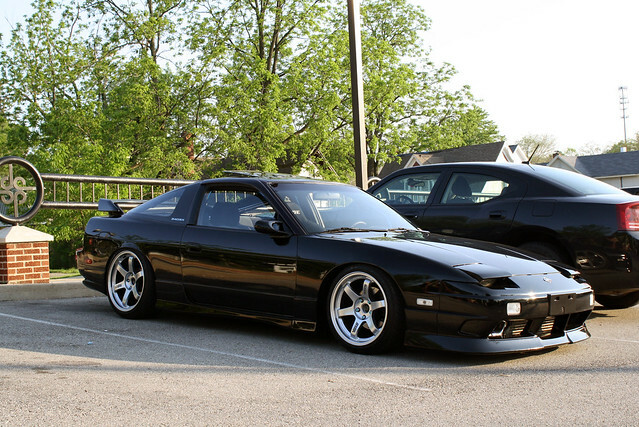 The ZEROS was the seat that was previously installed in BH’s 180SX when he had it. 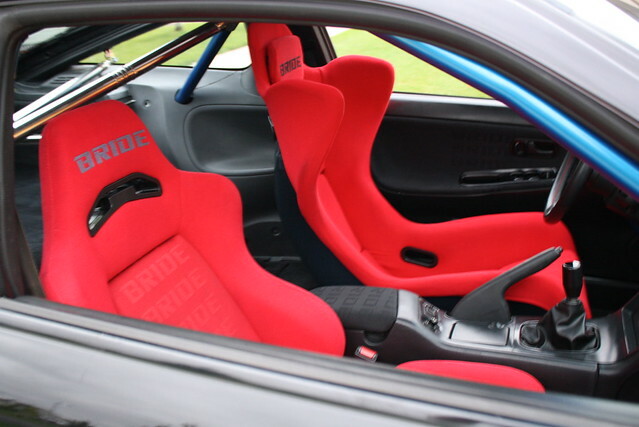 I was randomly searching google one day and found an old for sale listing on the Subaru forums for the seat. I sent him a message and found that the seat had never sold, so we worked out a deal. 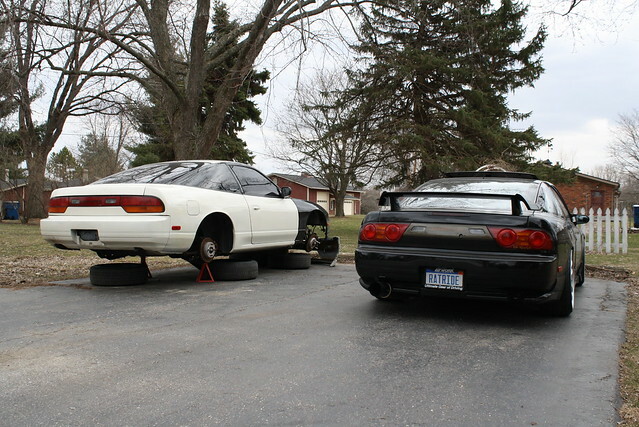 I had picked up a NeXt Miracle Cross Bar over the summer, so I removed my kouki 180SX rear seat and sold it as well as my 180SX passenger seat I was running previously. I really liked the change that the red seats brought to the car. The combo of the ZEROS and NeXt bar without a back seat really took the interior over the top. While I was at Kyle’s for Toby’s BBQ, we ended up trading glove boxes and arm rests. 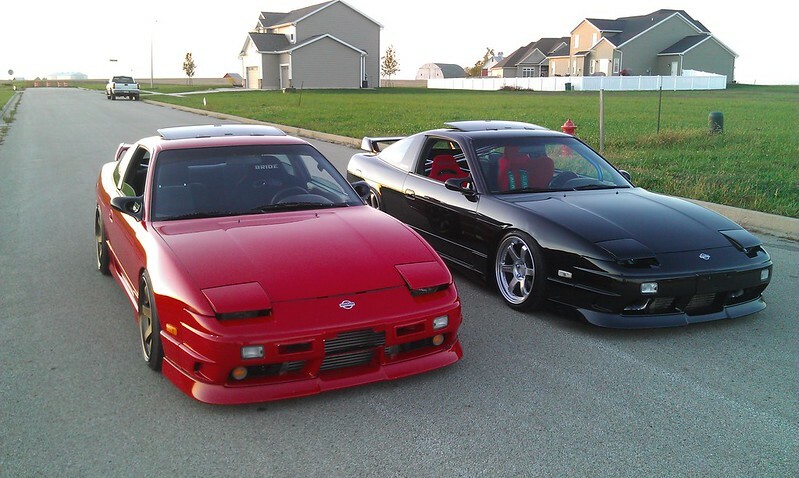 Kyle’s were wrapped in red fabric and mine was still black. Kyle also ended up with my black Bride fabric door panels and Toby helped me to wrap a new pair of panels with red fabric during the winter of 2012. Speaking of the winter of 2012, it ended up being one of the most dramatic changes to the car during my ownership. After seeing Toby’s LS swap and shaved engine bay completed when I visited Illinois, I finally became fed up with my engine bay. The fuse boxes were an eyesore and the paint was in really bad shape. I had all of the right parts there, but it just didn’t look show quality. After seeing a lot of crazy Honda engine bays at Import Alliance and Wekfest, Toby’s freshly painted bay was the last straw. I began to plan out some big changes for the winter of 2012 and promptly began tearing into the car. Check out Part 5 to see the result of one of the most drastic winter overhauls to my car- and what eventually led to me parting the car out. Thanks for reading!